Compact night vision monoculars NVMT Spartan are designed for nighttime observation and orientation. Device’s most prominent feature is the extra powerful built-in IR Illuminator increasing viewing range up to 2-2.5 times. The IR Illuminator enables observation in lowlight conditions and even complete darkness. Use of additional accessories makes the NVMT Spartan especially versatile. For example, with the help of an adapter you can take pictures and shoot video clips. 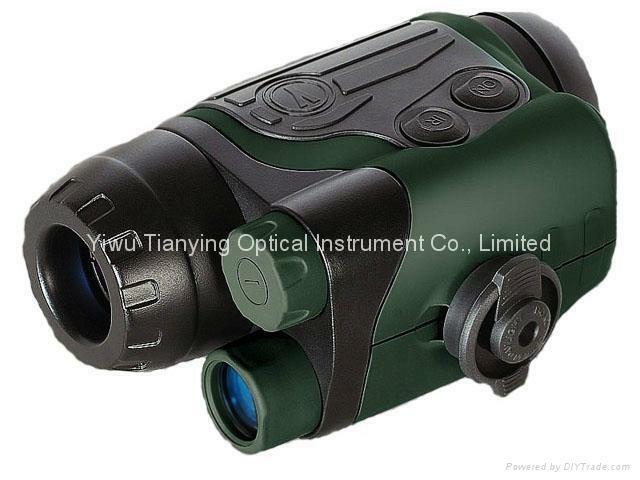 The NVMT Spartan 4х50 features impressive 4-power magnification and great light gathering capacity. This model is great for night photography, game spotting and surveillance. Compact night vision monoculars NVMT Spartan are designed for nighttime observation and orientation. Device’s most prominent feature is the extra powerful built-in IR Illuminator increases viewing range. The IR Illuminator enables observation in lowlight conditions and even complete darkness. Use of additional accessories makes the NVMT Spartan especially versatile. With the help of adapters you can take pictures and shoot video clips; changeable lenses will increase magnification of your device. NVMT Spartan 3x42’s magnification is high enough to use for long-distance observation, but it is compact enough to fit in a pocket. This affordable, compact, lightweight monocular provides comfortable viewing and versatility for numerous activities. Compact night vision monoculars NVMT Spartan are designed for nighttime observation and orientation. Device’s most prominent feature is the extra powerful built-in IR Illuminator increasing viewing range up to 2-2.5 times. The IR Illuminator enables observation in lowlight conditions and even complete darkness. Use of additional accessories makes the NVMT Spartan especially versatile. With the help of adapters you can take pictures and shoot video clips; changeable lenses will increase magnification of your device. The wide field of view makes the NVMT Spartan 2x24 perfect for observation in the open space and comfortable viewing of dynamic objects. The NVMT is an excellent choice for general observation and home security.